The invention of the radio harkened a new age. The technology uses radio waves which power radio instruments, and was originally called "wireless telegraphy." Originally developed in the 1880s, the first successful transatlantic radio broadcast was achieved by Guglielmo Marconi, who is commonly thought to be the inventor of the technology. Clearly, that's not exactly true, although the term "radio" came into use after his transmission across the Atlantic. We all learned in school, if we were paying attention, that Guglielmo Marconi was the inventor of the radio in 1895 and patented it the next year. But Mr. Marconi did not just wake up one morning and realize he knew how to make a machine that would transmit a voice. No, of course not. He relied upon more than 80 years of technology, beginning in Denmark in 1820 when physicist Hans Christian Orsted realized that there was a relationship between magnetism and electricity and proved that relationship. In 1875, Thomas Edison, who had been experimenting with Samuel Morse's invention, the telegraph, discovered something he called "etheric force," which we know today as high frequency electromagnetic waves. Edison believed this force to be the way to scientifically prove the validity of the occult and other supernatural phenomena. He was only steps away from inventing the radio at that point, but the ever-sensitive inventor of such fame abandoned the etheric force when other prominent men of science made fun of both him and his ideas. Other contributors to the invention of the radio included Michael Faraday, James Maxwell, Mahlon Loomis, Heinrich Hertz, and of course, Nikola Tesla. But given that all science is built on prior science, we can thank all who contributed to Marconi's invention, as well as Marconi himself, and I can tell you a little bit about what all happened next. 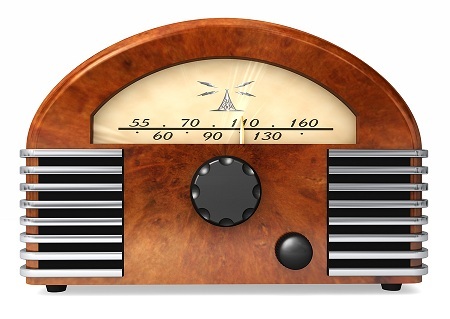 By the 1920s, radio was available to anyone who could buy or make one. Now, the younger generation would read that sentence and say, "MAKE a radio? That's crazy!" But back in the day -- meaning most of the 20th century -- before the Walkman, the iPod, satellite, or HD radio, many radios were powered by a crystal set. And due to the Boy Scouts, most boys and many girls built at least one radio set as a youngster, despite the fact that vacuum tubes replaced crystal sets in store-bought radios. While we called them crystal sets, they were also called a cat's whisker receiver or, more properly, a crystal radio receiver. Crystal sets ran on power received directly from radio waves. No battery or electric plug was needed. You can make a radio out of about 100 feet of stranded, insulated wire, a plastic bottle -- or a toilet paper roll -- 50 feet of magnet wire coated with enamel, a crystal or diode, alligator jumpers, and a telephone handset. Or you can buy a kit from a hobby shop or Radio Shack. But I digress. The crystal radio receiver was invented in 1906. The first commercial radio station, KDKA, hit the air in 1920, in Pittsburgh, Pennsylvania, and the first item the station broadcast was coverage of the 1920 presidential election, which began at 6:00 on election night and lasted until noon, when the ballots were counted and it was determined that newspaper publisher and one of Ohio's United States Senators, Warren G. Harding beat Ohio Governor James Cox. Throughout the broadcast, the announcers repeatedly entreated the audience, "Will anyone hearing this broadcast please communicate with us, as we are anxious to know how far the broadcast is reaching and how it is being received." The broadcast was received as far away as Canada. KDKA is still on the air today as a CBS affiliate. FM radio, short for "frequency modulation radio," started out as experimental in the 1930s, and stereo FM made its appearance in the late 1950s. Satellite radio was introduced in 1992, with XM introducing what is ow SiriusXM radio, which is broadcast over radio receivers as well as over the internet. Along the way, there were other offshoots of the radio, including walkie-talkies, shortwave radio, amateur or ham radio, radar, and radiology. So you see, whoever should be credited with the radio, it has shaped much of our lives. Delves into the invention of the radio and all of the technological developments which made that invention possible. The focus of this website is on the years between 1895 to 1925, rather earlier than the usual timeline, which starts around 1940. Also has numerous images from the era. Beginning with Marconi in 1895, this site chronicles the beginnings of radio, including Fleming's valve and crystal detectors. Profiles commentators, including Edward R. Murrow, Eric Sevareid, Sigrid Schultz, and Drew Pearson, as well as radio events such as the Hindenburg disaster, Pearl Harbor, the Battle of Iwo Jima, and the funeral of Robert Kennedy. Chronicles the work of Jagadis Bose the polymath who pioneered, among other things, solid state radio, archaeology, plant science, and microwave optics. Rounds up information about the history of the early days of the wireless, or radio as it became known. It has an overview, an account of the history of the electric telegraph, telephone, and finally, the wireless radio.